There are many myths surrounding the filing of bankruptcy cases, but two of the most persistent are really two sides of the same coin. On the one hand, people often believe that when they file a bankruptcy case, they will lose everything. That, of course, is not true. It is also a common belief that filing a bankruptcy case means that all their debt evaporates, and that they can keep their cars, houses and other property that served as collateral without having to repay the loans. This, likewise, is not true. When you're considering filing a bankruptcy case, it's important to understand what property you can keep and what you'll have to do to keep it. A secured loan actually involves two different agreements: the promissory note and the security agreement. The first one, the promissory note, contains the terms for the loan. In it you find the financials on the amount you will finance, interest rates, amount of the payment, length of the loan, payment due dates, how payments are to be made, conditions for and amount of late fees, the total amount that will be paid over the life of the loan and much more information concerning how you are expected to pay back the money you borrow. The security agreement is a separate contract, although it may be included in the same document as the promissory note. The security agreement gives the lender certain rights in the property you financed. The item becomes collateral for the loan. The lender agrees to put up the purchase price of the item. You agree that if you fail to pay according to the terms of the promissory note, the lender has the right to seize the property (repossess or foreclose), liquidate it (sell it) and apply the proceeds of the sale to the amount you still owe the lender. In a bankruptcy case, the obligation under the promissory note - the requirement that you pay the loan back – is subject to the discharge. Therefore, if you do nothing to change the outcome, the promise you made to pay the money back will be discharged when you receive your General Discharge. Sounds great, right? That’s what you’re looking for in Chapter 7 - relief from having to pay back those burdensome accounts. But, there’s a kicker. The security agreement is not discharged. The lender still has an interest in the property and the right to repossess or foreclose on the property if you don’t pay. Some people can find themselves with a discharged loan and no obligation to pay, but still holding onto the collateral. You probably will not hold that collateral for long, however. That’s because the lender will almost always want the property to pay at least a portion of what you owe. The lender will also not have to wait until the end of a Chapter 7 case to start that process. When you file a Chapter 7 case, one of the documents included in the paperwork is called the Statement of Intention. In the Statement of Intention, you list all of your secured debts, and you state whether you intend to keep the property or surrender it to the lender. If you do not want to keep the property, you are required to make it available to the secured creditor no later than 45 days after your meeting of creditors. 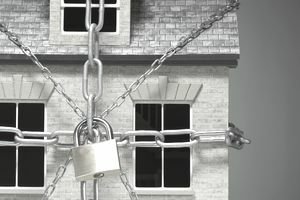 If you have not surrendered the property by then, the secured creditor can start foreclosure or repossession without having to get permission from the bankruptcy court. In Chapter 7, you have two other options stated in the bankruptcy code: redeeming the property and reaffirming the note. Redemption is especially useful if you owe more than the property is worth. It is used almost exclusively for personal property like vehicles or appliances. It allows you to pay the value of the property to the creditor, usually in a lump sum. That will satisfy both the promissory note and the security agreement. To accomplish this, some borrowers refinance the property through other lenders, like companies who specialize in helping debtors redeem property. Because many borrowers either can’t raise the money to redeem the property or don’t want to pay the higher interest rates a redemption funding company will charge, many borrowers will opt to reaffirm the debt they already have. A reaffirmation is a process that takes the loan outside of the bankruptcy. The discharge will not apply to a reaffirmed loan, and the debtor remains responsible to the lender on both the promissory note and the security agreement until the loan is paid. Debtors can only reaffirm loans if they can actually afford the payments. Most of the time, the bankruptcy schedules, including the list of income and expenses, will show that there's room in the budget for the payment. If there isn't, it may be necessary to have a hearing before the bankruptcy judge before the reaffirmation agreement is approved.